DesignCentrix was more than thrilled to pack up and head to Vegas for this years Society for Human Resource Management (SHRM) Show. SHRM stands as the world’s largest HR membership organization with over 275,000 members in over 160 countries. Providing global best practices and networking, SHRM is a great opportunity for companies to not just attend, but stand out in the crowd. 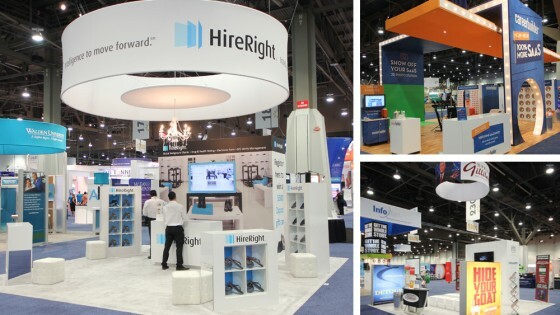 This year we helped our clients CareerBuilder, HireRight and Steve Gilliland do just that. Partnering with CareerBuilder over the last eight years has given DesignCentrix the opportunity to develop a variety of booth blueprints and design concepts as the company’s needs have evolved. 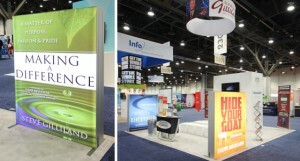 At SHRM, we unveiled a new 30 ‘x 50 ‘ island built from the ground up. Implementation of a 3D Photo Booth alongside Custom Shoe and T-Shirt Displays created a memorable experience for all visitors. The interactive highlight was a prize wheel, where visitors spun for a chance to win a free pair of Converse shoes – at times the line was covering three sides of the booth! 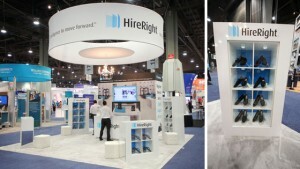 HireRight’s booth DesignCentrix developed for last years SHRM was such a big hit, they decided to showcase it again. This high-end 20’ X 20’ retail atmosphere wore a crisp blue and white brand scheme, complemented with custom-built shoe displays, highlighted by integrated accent lighting strategically placed to tell the story of their design. A beautiful crystal chandelier pulled the lighting features together with a touch of elegance centered off of on screen interactive messaging provided through an inset TV surrounded by a decorative picture frame. From creative prize wheels to best-selling book displays, DesignCentrix was thankful to interact with a variety of clients at SHRM. We look forward to seeing what next years show brings.